The new regulatory requirements are laid out in CRM2, the second phase of the Client Relationship Model adopted by the Canadian Securities Administrators. 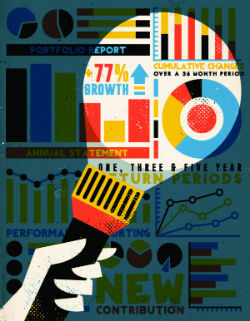 Under these rules financial institutions must now provide investors with two new reports. These reports are separate from the portfolio statements investors already receive and view online. While portfolio statements dazzle with tables and charts to illustrate performance, they leave out some crucial information. The new mandate attempts to fill in the gaps with one report focusing on performance and the other summarizing charges and compensation. The new rules state that financial institutions, like banks and discount brokerages, only have to provide investors with a one-year personal rate of return this year, regardless of how long the account has been open. They have until 2019 before they have to provide a three-year rate of return. In contrast, the reports Tangerine clients will receive over the coming weeks are more robust. “We’ve gone a little bit beyond the minimum requirements,” says Tangerine Investments Director David McGann. The difference is most noticeable on the performance summary Tangerine will be sending to clients. That report will itemize client deposits, contributions, withdrawals, as well as provide an annualized rate of return since the account was opened. “The focus of these new reports is strictly about more transparency,” says McGann, particularly when it comes to fee disclosures. This is going to catch investors by surprise, he says. A survey conducted on behalf of Tangerine found that more than a third of respondents said they don’t pay any fees. Another 11% of said were unsure if they pay fees at all. There is going to be a huge sticker shock, predicts McGann. Some investors are going to see fees in the thousands, he adds. Investors should know, however, that the charges they see in this new report will only show a portion of fees. While they will see transaction charges and trailing commissions, they won’t see the full breakdown of the management fees on products they may hold. Still, there is some information investors—particularly DIY investors—will want to pay close attention to. Some may be surprised to learn that they are paying trailing commissions (a charge embedded in a mutual fund’s fee designed to compensate advisors for their time) even though they aren’t receiving any advice. The new information in the reports provide a starting point for a discussion, says Bradley. He thinks clients should ask for longer-term returns, preferably since inception. Most firms can provide this (or at least time-weighted rates of return) with a push of a button. Investors should also ask their financial providers to provide some context for their returns. Investors should compare their returns to a benchmark or an average fund with a similar mandate. If you don’t think you’re getting value for the fees then ask if there is a way to lower them. “Most firms have some items that are negotiable,” says Bradley. Hover over or tap to see details.